I shoot lightning. I have specialized gear and cameras just for this. The Fuji X Pro 1 is NOT a camera system that we would normal associate with daylight lightning photography but sometimes we just get lucky! But, I choose to be both SMART and LUCKY when I am shooting bad weather including lightning, even if I am not properly prepared. 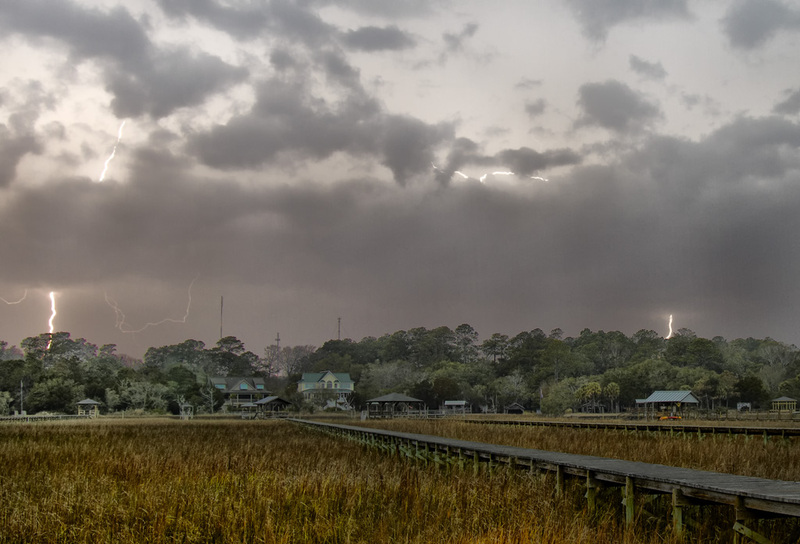 In this post I will share the process of capturing lightning strike images with you! Normally, I have a Canon 7D or sometimes a Panasonic GH2 dedicated to shooting daylight lightning. I use it with a Canon 17-40L lens and the Lightning Trigger from http://www.lightningtrigger.com/ which is the BEST lightning trigger on the market simply due to its automatic gain and sensitivity circuits built into it by its creator! If you want to shoot serious lightning images during the daylight this is the system to get. 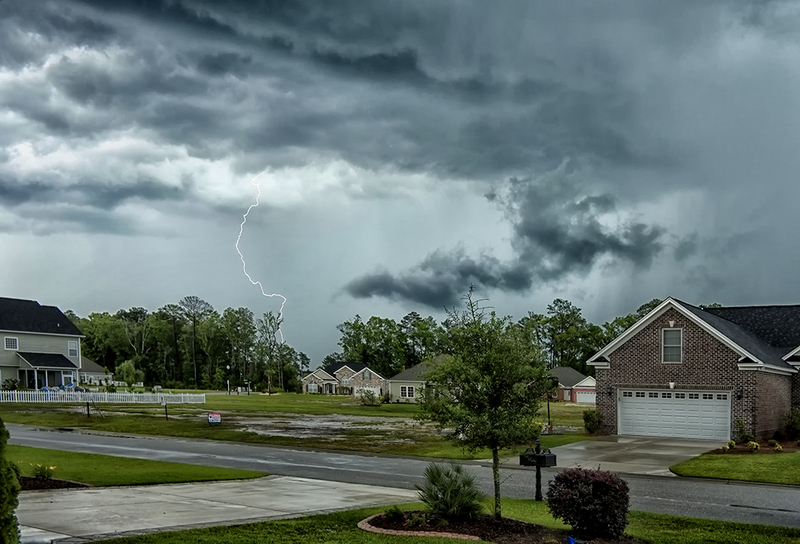 But on this particular day I was at a daughters house waiting for the cable guy to arrive when we had a 100 year storm blow across the Low Country of South Carolina. We had over 600 lightning strikes! There I was stuck at her house with my lightning camera system at home, no tripod or nd filter and only my new Fuji X Pro 1 camera system in the truck. I was so mad at myself for not bringing the other equipment along that I almost missed the entire storm. Eventually I went out to the truck and got out the X Pro 1 and set it up with the Fuji 18mm lens and started shooting in a vain attempt to capture a few strikes. This is difficult as most lightning strikes are there for an instant then gone… But once in a while a feeder will go up from the ground and cause a multiple discharge from the cloud down that can span a second or two! For this image that is what happened. I saw the strike, triggered the shutter while pushing the camera into one of her porch columns and hoped for a multiple discharge to lengthen the strike time. I got lucky and actually managed to capture a rare daylight strike by hand! Several Cloud to Cloud and Cloud to Ground Strikes. Cloud to cloud: This type of strike is on the edge of or within the cloud itself. It is pretty but not as emotionally charged as a ground strike. Usually these strikes are high speed with a single pulse and unless you are currently making an exposure your chance of capturing one without a Lightning Trigger is going to be very rare. Here is an example of one such strike showing 6 separate strikes in the same exposure at once! Look closely at the image on the right and count the actual strikes in the picture. Cloud to Ground, single pulse: This strike is a quick flash usually with out branching strikes. 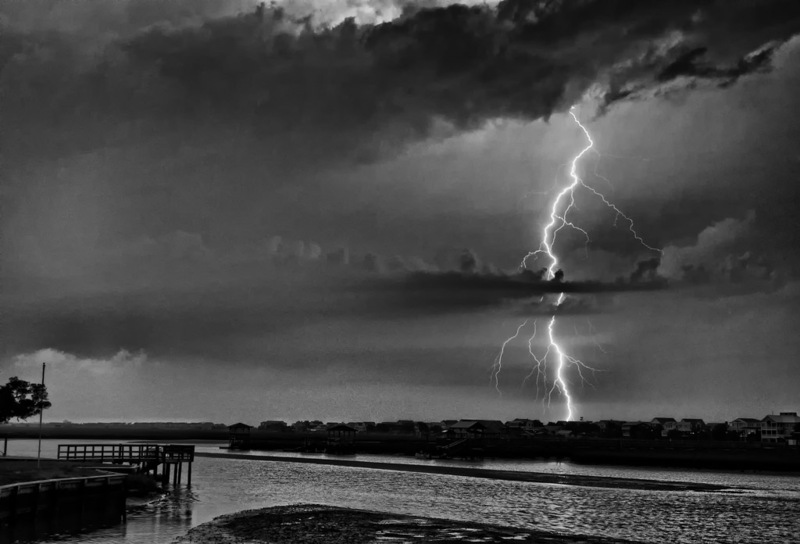 It is so quick that the only chance you really have of capturing one is for you to be using a Lightning Trigger or have a long exposure currently in process during the strike. These types of strikes are not as dramatic as a multiple pulse strikes because they are not as bright and do not usually branch out like a tree limb while searching for the upward leader. Still, any lightning capture is worth the time and frustration necessary and you will be happy to have captured this! Have you noticed in viewing these images how much more dramatic the daytime strikes are? Again remember to think in terms of both Color and B&W lightning images. Cloud to Ground, multiple pulse: This is the big boy of strikes and what we are actually looking for in lightning photography! In this style of strike a ground feeder rises from the ground towards the sky. A bolt releases from the cloud searching for it and will wander all over the sky as it moves down. It will branch out into many bolts like tree limbs during its search for the leader. Once it finds the leader it will pulse multiple times down the same path as it discharges. This type of strike can last up to 2 seconds and will generate very bright pulses of light as each discharge travels down the same path! as a photographer, you have a good chance of capturing this type of strike by firing the shutter when you see the first strike and hope that it is a multiple pulse strike! Of course you can also get lucky during a long exposure in that the strike happens while the shutter is actually open! Tree Branch Multiple Pulse Strike! Notice the branch structure searching for the leader pulse! Think of shooting in B&W also for a dramatic image. 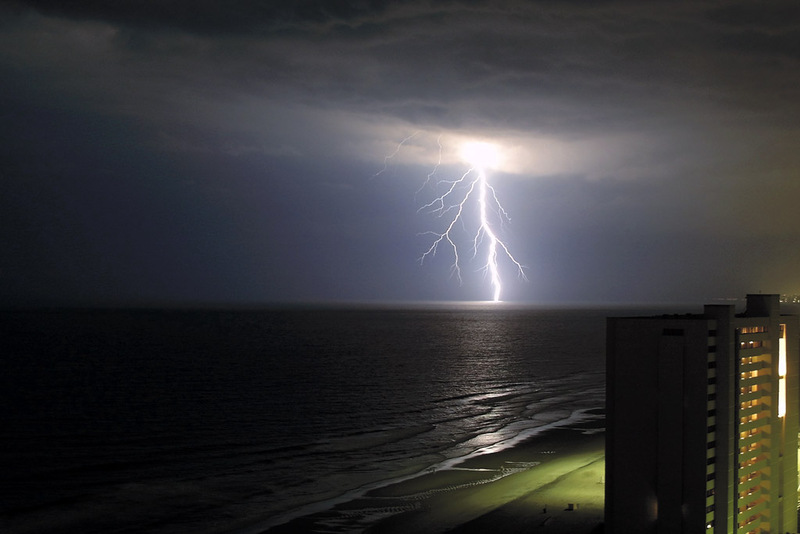 This image was captured with a Canon 7D and a Lightning Trigger. Mount the X Pro 1 on a sturdy tripod in a protected environment. Use a variable or set ND filter around 6 stops to slow the shutter speed down. The longer the shutter is open the better the chance of a capture! Set the camera shutter speed to A. Adjust the aperture to f/11 or higher to slow the shutter down. Set the drive mode to high speed continuous. Set the camera to Manual focus and focus on something in the mid ground. 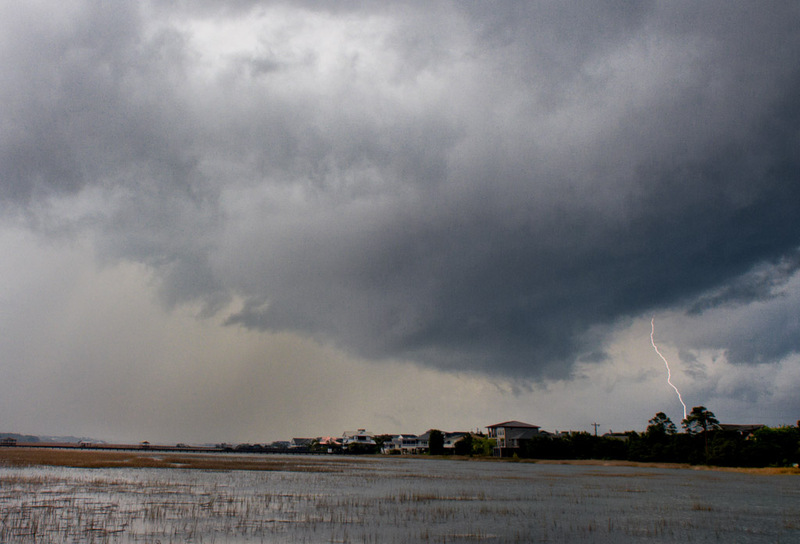 Try to setup your composition with some natural structure in the foreground and background to give the image depth in an area where you have observed lots of strikes. Watch for a strike within your framed area and trip the shutter release while hoping for multiple strikes down the same feeder which can last for a second or two which will guarantee you an image of a strike! Keep shooting during the storm. Do not get discouraged. As I earlier stated, this technique is more of a guessing game and you will be lucky to actually capture a strike, but it WILL happen! 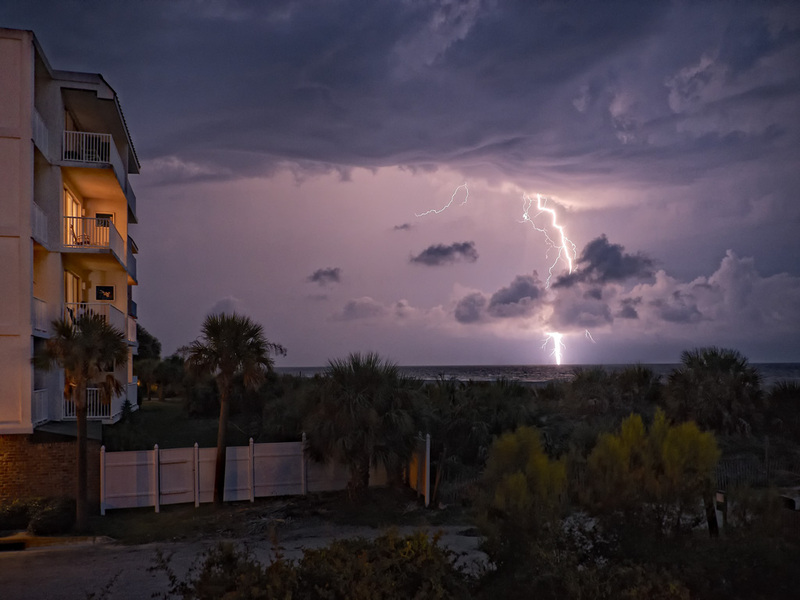 Now, the other style of lightning photography involves shooting at night. This style will work with ANY camera system including the Fuji X Pro 1. The only requirements of your camera system are that it can be mounted to a tripod, have a remote shutter release and have a manual exposure mode. Experience has also taught me that a wide angle lens will produce a better image. For nighttime lightning, the X Pro 1 will work great. You simply put it on a sturdy tripod in a protected environment. Set the camera shutter speed on 30s or bulb. Shoot into the storm at about f/8. Try to setup your composition with some natural structure in the foreground and background to give the image depth. Consider light painting a foreground structure with a bright flashlight during your exposure. When you have captured a strike or 2 while the shutter is open in bulb you then release it. If you are set at a 30s exposure you wait till it is finished. This is the way photographers manage to get several strikes in the same image! It is easy but you DO have to be careful and make sure that you are not in danger of being hit yourself. 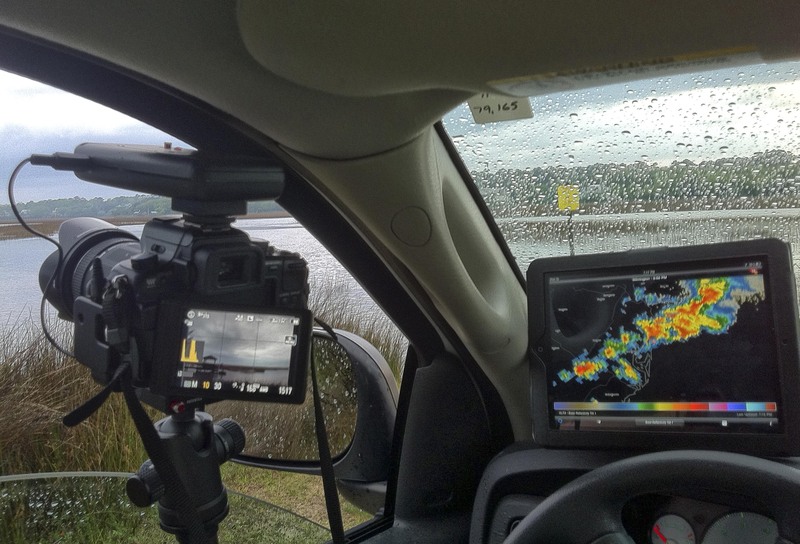 I usually setup inside of my truck with a tripod and an iPad for watching the weather radar and shoot out an open crack in the window. If the truck is struck, the metal will guide the lightning around you to the ground. As I said, unless you simply get really lucky with your shutter release timing you are going to get very frustrated with the X Pro 1 for daylight strikes, but for night time, it is the perfect tool! Go out and give it a try! Thanks Jodie, I have a lot of fun doing all of this! Love these little sections by you on this kind of stuff…thanks. Thanks John, I have a lot of fun with all of this! Thank you for your informative article about photographing lightning. It perked my interest. I setup my camera on tripod a couple nights ago, when there was a thunderstorm in the distance. Using 2+ seconds Timed shutter, I took a lot of duds but, managed to get two nice photos when the lightning lit up the inside of the cloud. I want to buy a threaded mechanical cable shutter release. I’ve “window-shopped” on eBay, Amazon, Adorama and B&H and need some help with the features. What remote shutter release do you use with your Fuji X-Pro 1? Do you have a preferred length of cable, type of locking mechanism(screw or disc) and outer jacket material(vinyl, cloth or braided stainless steel)? Any other recommendations would be appreciated. Best Regards, Frank F.
Frank, thanks for the comments! You might also consider a small value ND filter, say 3 stops and use that at night to get a longer exposure. Try to be in the 20 to 30 second range. Be protected though… Lightning is dangerous. Nice shots and blog write up, Mark!